There are published minimum FICO scores for many government-backed mortgage loan programs including FHA loans. The VA home loan program requires no down payment AND has no VA-required minimum FICO scores, but they're not available to just anyone. January 27, 2019 - Recent published articles online ask the question, “What credit score do you need for a mortgage?”. Some of these same reports suggest that a FICO score of 500 is sufficient to get a government-backed mortgage loan such as a USDA, VA, or FHA home loan. There are published minimum FICO scores for many government-backed mortgage loan programs including FHA loans. The VA home loan program, which requires no down payment AND has no VA-required minimum FICO scores, is one that most borrowers would be thrilled to take advantage of. But VA mortgage loans are available only to those who have served a minimum time in uniform in the United States military. USDA loans, which also have no down payment requirements but DO have income limits and are offered only in approved rural areas, has a minimum 640 FICO score rule. FHA mortgage loans do indeed have a minimum FICO score of 500. But this requirement is NOT an indication of the lender’s requirement, and the FICO score range between 500 and 579 requires a 10% down payment. FHA loans for borrowers with scores at 580 or higher can make the lower 3.5% assuming they otherwise financially qualify. Lender minimum standards will also apply. 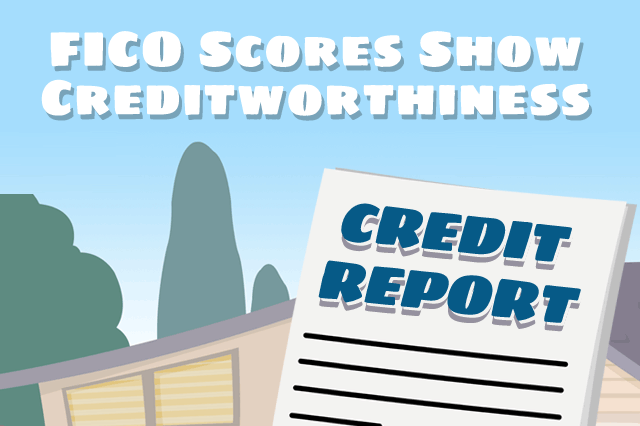 Some borrowers assume that FICO scores are the primary “approve or deny” criteria for getting a home loan, but those with high debt ratios soon learn that the amount of debt you have compared to the amount of income is also a very important factor in home loan approval. And it is also good to keep in mind that a low credit score does not always mean “irresponsible use of credit”. A lender who sees a borrower has made consistently on-time payments may view the FICO score issue differently. A borrower who isn’t carrying too much debt compared to income, and has money for a larger down payment could find a lender willing to work with them even when credit scores are lower than the borrower would like. The key is to have these compensating factors working for you going into the home loan process. That is why it’s a very good idea to begin planning for your home loan application a year or more in advance; it takes time to establish the payment habits if they do not already exist and save up money for the largest down payment possible as a potential compensating factor.